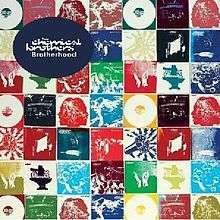 Brotherhood (subtitled: The Definitive Singles Collection) is a compilation album by English big beat duo The Chemical Brothers, released on 1 September 2008 (2008-09-01). It is the second compilation spanning the band's greatest hits, after 2003's Singles 93–03. The first disc features thirteen hit singles and two new tracks, "Midnight Madness" and "Keep My Composure" (featuring a guest appearance of the rap group Spank Rock)—while the second CD contains all ten parts of The Chemical Brothers' "Electronic Battle Weapon" series of special mixes, which the duo have been recording since 1996. ↑ "Brotherhood Reviews, Ratings, Credits, and More at Metacritic". Metacritic. Retrieved 27 May 2012. ↑ John Bush. "Brotherhood - The Chemical Brothers". Allmusic. Retrieved 4 October 2011. ↑ Scott Plagenhoef (4 September 2008). "The Chemical Brothers: Brotherhood". Pitchfork. Retrieved 4 October 2011. ↑ Christgau, Robert. "CG: The Chemical Brothers". RobertChristgau.com. Retrieved 27 May 2012. ↑ Davidson, Darren (5 August 2011). "Chemical Brothers team up with Google Earth to promote new album". Brand Republic. Retrieved 4 October 2011.